We met in 2010 at a mutual friend’s lake house at Lake Texoma. We were friends for two years, during which time I got know that humility, selflessness and thoughtfulness are woven into Matt’s fabric. During a fateful group trip to Napa, something changed. I no longer saw Matt as just a ‘great guy’ but also interesting, attractive and just-my-type. It must have been the wine! Matt made all of my secret Pinterest dreams come true! 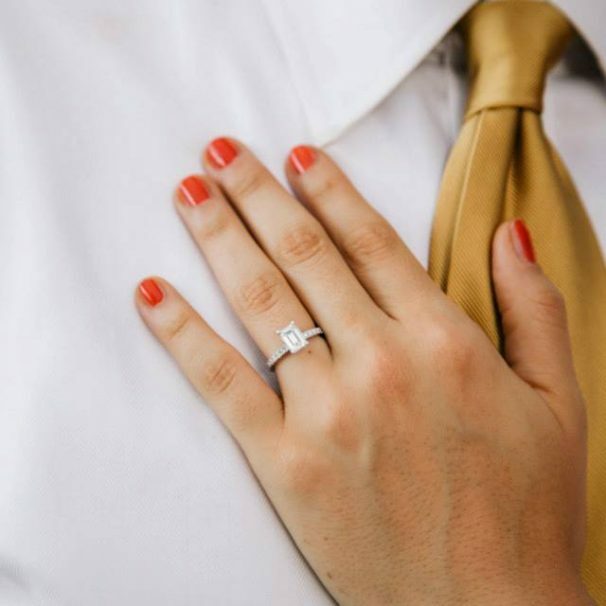 Literally, he found my secret Pinterest board and created an amazing proposal and surprise engagement party. After a fancy ‘anniversary’ dinner, he took me to the Winspear Opera House, which has always been my favorite place in Dallas. He lured me there under the auspice of “playing ping pong”, which wasn’t the first time! As we walked up to the reflection pool, I noticed huge illuminated letters ‘N + M’ … I dropped my ping pong paddle and purse on the ground! We had an emotional walk through the shallow water before he dropped to one knee to ask me to marry him. Yes! His sister had set up the letters with beautiful burgundy peonies and was hiding behind a tree capturing everything! After a little engagement photo shoot, we went back to Matt’s house to “celebrate with our parents”. When we walked in the door, I was incredibly surprised by a huge party with special friends and family! 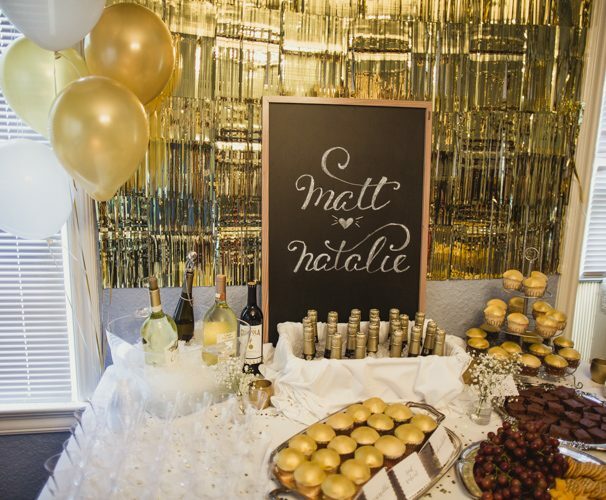 Matt had decked the party with gold fringe, gold balloons, burgundy peonies and chalkboards! 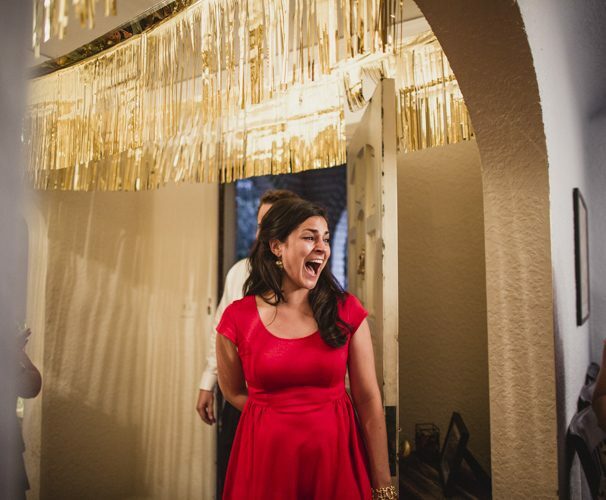 He had gold cupcakes and mini bottles of champagne waiting– my Pinterest board come to life! 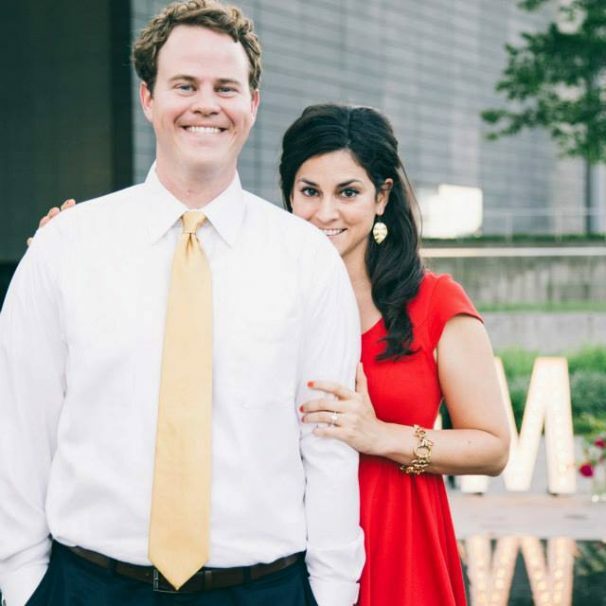 We were on such a high that we couldn’t imagine a wedding being better than our engagement – but no doubt it was! 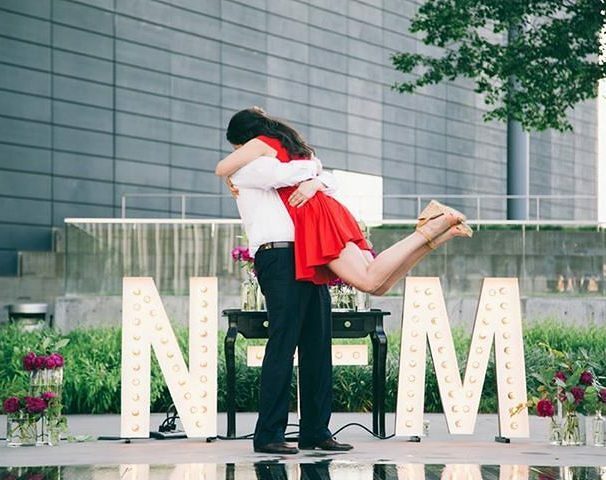 We used the N+M letters from the engagement on the cake table at the wedding. Matt works for a sign company and had the letters built in the “marquee style” I had pinned on my secret board.